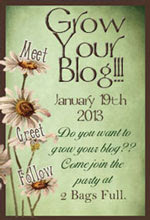 Sandra Kaye: Grow Your Blog Party!!! Thank you for visiting my blog. Your quilts are incredible! And I LOVE that bag! How fun is that!! Wow, what a beautiful quilts! I would love to learn this art but for some reason me and my sewing machine talking a different language - I can sew a straight line. I was thinking about learning to quilt by hand - well, I'm not there yet. You have a lovely blog! Have fun at the party! Hi,Sandie! My name is Patrice. I think your work is lovely, and really like the quilts. I enjoyed visiting your blog. Ooo! Poodles! I love poodles. I was raised with poodles. Standard are my favorite. We do not have poodles right now, but I'd gladly have one. I live on a farm. I used to be a chef in a big historic estate. The woman there loved to quilt. She gave me loads of fabric and magazines. I want to learn to quilt soon. I have followed you and I hope you will do the same. I think we could be blog friends.You'd enjoy some of the folks who come to my Tuesday meme, Chats on the Farmhouse Porch. There are so many super people in blog world. I'm always amazed by your work, nice showing! Always a pleasure to see what you are up to! Thanks a bunch for visiting my blog! You do amazing work, so colorful & lively! You always inspire me Sandie. Sandra, you sure are into stuff! I love your work and can appreciate a good quilt when I see one and yours are fantastic. Thanks for dropping by today and it's good to meet you. Nice photos. I'm sure whatever you make will be well received. WOW - the colours are wonderful - I feel so happy here visiting your blog! Such inspiring quilts and journals. As you would have read on my GYB post I'm just about to start on my patchwork/quilting phase, so there's much here I can learn from you! I did a couple of journal classes online with Pam Carriker - they were great but I find fabric is my first love - I wish I could play all day and then I could fit it all in! Thank you so much for coming to see me and leaving your lovely comment. I love your fur babies. And that mandala on top of stamps is just marvelous. Great work. I found you thru the blog party. Do come and see mine. Color makes us happy too! Your quilts are GORGEOUS and I love your art journals. Thanks for sharing with us! Hi Sandie, I love your blog and all of the rich colors you play with. Your quilts are stunning and I really love your art journals... you have made them your own and they are fabulous! I am your newest follower and look forward to future posts. Off to visit more blogs on Viki's blog party tour but I will be back! Your quilts are absolute lovely with such beautiful colors. I came here through the Grow Your Blog party, and I am glad I did. So nice to meet you. I've been following your blog for a while and have serious art envy! I'm a dedicated quilter and would love to be able to draw and journal like you do. I've bought lots of supplies have done a bit of scrap booking to start with but have zero ability when it comes to drawing. Baby steps I guess. It's always inspiring to see what you're up to. Deb. I love your use of colors, they're so bright and cheery. I also had to become a follower. Hi Sandie - You've given my spirits such a lift with all of your beautiful coloured quilts and journal pages, bags etc. after all we have been through with the dreadful fires here! Lilly and Jack our poodle babies were tuck safe away through it all! Oh Bella looks like she might be fully grown by now? Please give them all a big squeeze with love from me! Sandie - you know I love your journals and the one made from the vintage leather photoalbum is so cool - just love that. oh my - you bag is totally amazing. I can why they sell right off your shoulder. It´s fab. and so colorful and bright. I love that you used it for your art journal. You do love color! Your blog is very cute and I can see that you have a lot of fun with creating! Stop by my blog if you get a chance during the party! Oh, and I love your journal. My favorite kind of journal is one with all kinds of different sizes, textures, colors of paper! What an inspirational blog to come to see! I adore all the bright colors. I am your newest follower and looking forward to reading more about your creations! I'm with you on loving color. 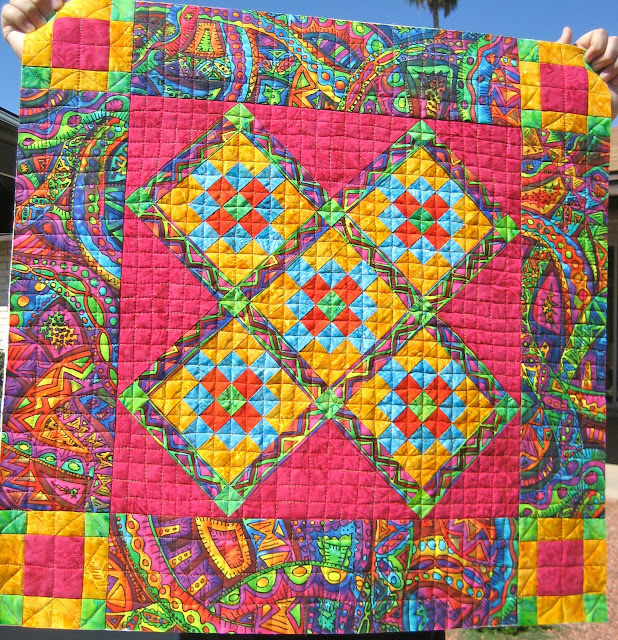 ♥ Your quilts just make me feel good...so much happy energy in them and the same with your journal art. I'm dropping in to say hello and let you know I'm in the GYB party too. I'd love to have you visit and leave a comment for my giveaway. Oh my goodness - you say you enjoy color!!! Yes, I can tell. And, I can see how your colorful bag was purchased right off your shoulder! Great post! I love all your beautiful projects!! I love your use of color... say it loud, say it proud!! LOL And that bag? I have no doubts that it barely made it to your shoulder before it got snatched away. Just lovely! I am your newest follower and appreciated that you became mine! Buddies forever!!! Wow! Love your work. That fabulous bag is awesome. Your journals totally inspiring. Will stay a while and soak it up. Would love your giveaway whatever it is! Thanks. Hello Sandie...it's so nice to "meet" you through the GYB party. I've made so many new friends. Your quilts are gorgeous! So colorful. Some day I will learn how to make a simple quilt. What a creative colorful and delightful blog! It is a wonderful way to connect and to be inspired..Hoping you are having a wonderful crafty week. OH MY GOODNESS! WOW! 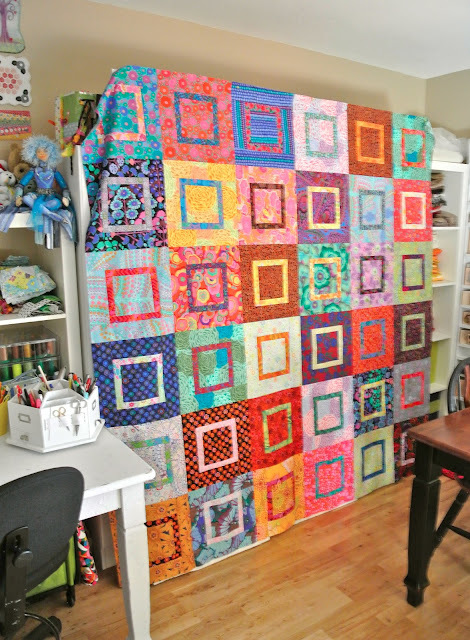 The eye-popping beauty of your quilts is amazing! Your sense of design and color is wonderful. 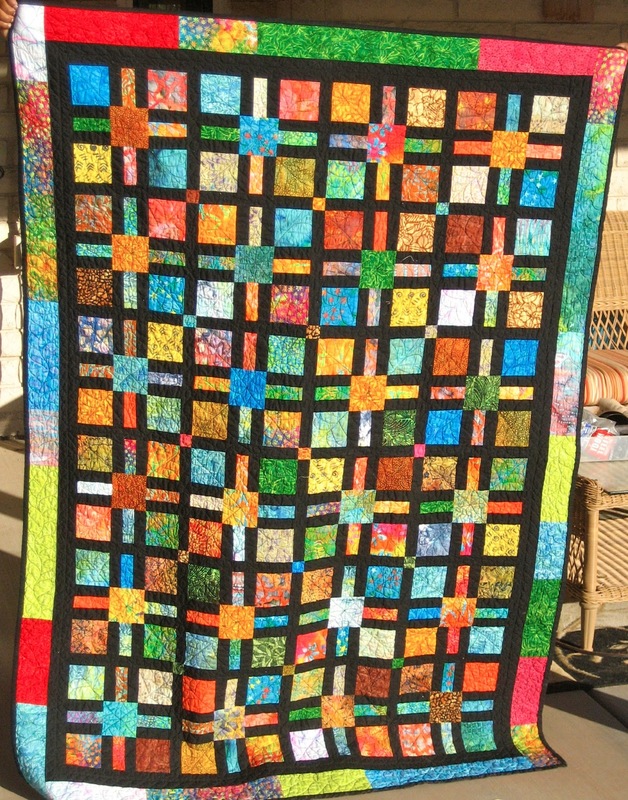 Yes, I'm a "quilter" - well, that was before I saw your work! I am really just a "follower of traditional patterns" but, like all of us who love the art, it brings me peace and happiness...the same way my pets do too! I love your "helpers." At least they don't "immerse themselves in the art" like my cats do! Such amazing colors and creativity! I love it! And I had to leave a comment when I saw your companions. I have 2 toy poodles, Tasha (5) and Mandy (9). They are with me all the time, too. You don't leave poodles alone. It would be like leaving a small child alone. Being a poodle owner, you will understand this. So glad I found your blog. Your art is fabulous. Would love to be a winner! I love your use of colour! Thanks for the giveaway. I look forward to reading more of your blog. Your blog is awesome, very colorful! I love your artwork! So nice to meet you via the GYB party! You do beautiful work. I'm a new follower from the GYB party. I also have a little 4 pound poodle, Millie. They are just the smartest breed aren't they! Your doggies are adorable! And that art journal bag!!!!!! And, I'm not surprised that someone bought your journaling bag right off your person!! i LOVE it!! beautiful fur babies and your work is inspirational; I'll follow as soon as I comment. Sandie - I love your use of color in your quilts and especially your art journal pages. I keep wanting to work in an art journal but I never stay with it. Don't know what it is. Maybe it's the time I don't give to more creative projects. In the meantime, I'll keep following colorful blogs like yours. Thank you. Hello Sandra, You have a fabulously colorful and fun blog! I love it! Your art is inspired. I really enjoyed having a look around. I am so glad Vicki hosted this fab GYB party! What colorful, beautiful art you create Sandie! Who doesn't love a surprise giveaway? I forgot to mention how adorable your pups are!